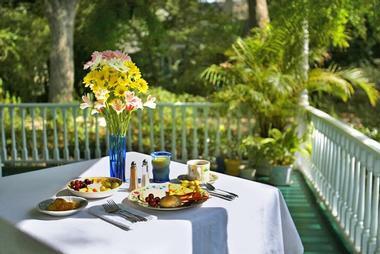 Magnolia Springs Bed and Breakfast is a romantic inn set on a tree-lined street in the heart of Magnolia Springs, Alabama. The charming bed and breakfast is a historical landmark and offers beautifully appointed accommodations, delicious homemade breakfasts and a tranquil and inviting ambiance in which to unwind. 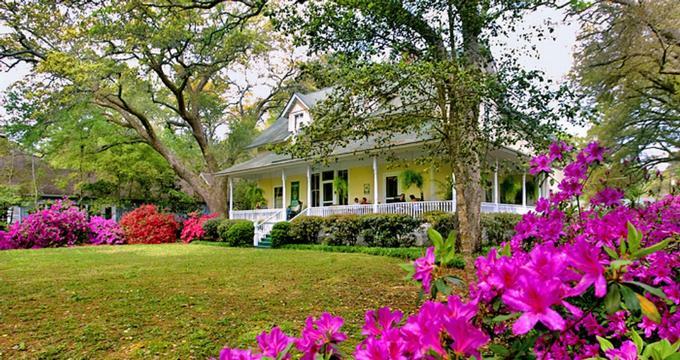 Magnolia Springs Bed and Breakfast in Alabama offers five quaint guest rooms and luxury suites with comfortable beds in plush country-style linens, private bathrooms, and modern amenities such as central climate control and complimentary wireless Internet. Guests are treated to a home cooked breakfast in the elegant dining room every morning and can relax on the wide porch with a refreshing drink in the afternoons and watch the sun set. Ideally placed for exploring the area, Magnolia Springs offers an array of things to do during your stay from taking scenic drives to the nearby Mobile Bay on the Gulf of Mexico, playing golf on one of the several golf courses in the area, or enjoying many of the natural and historic sites in the region. 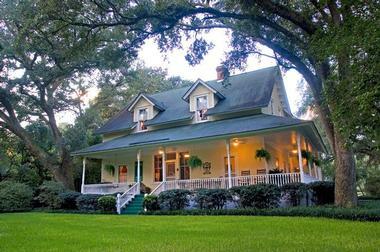 Magnolia Springs Bed and Breakfast offers five well-appointed guest rooms and luxury suites with comfortable beds in plush country-style linens, en-suite bathrooms with showers and/or baths, thirsty towels and deluxe bath products and cozy Southern décor. All guest rooms and suites have modern amenities, including flat-screen televisions with cable channels and DVD players, direct dial telephones, central climate control, hairdryers, irons and ironing boards, and complimentary wireless Internet. 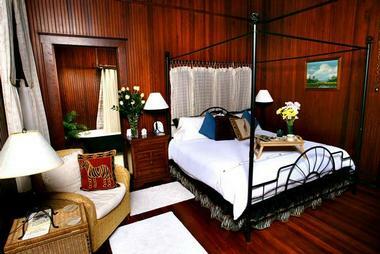 The Harding Suite is a deluxe two-bedroom suite that can accommodate up to four guests. The suite features one king bedroom and one queen bedroom, both of which boast high ceilings, spacious sitting areas, and private bathrooms. 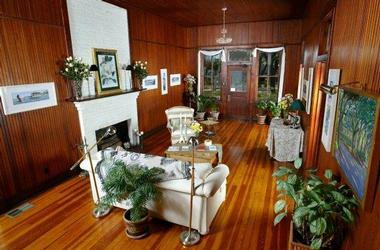 South and west-facing windows embrace stunning views of the surrounding oak forests, and modern abound. The Worthington Room is a beautifully appointed, nostalgic room with a queen-size bed in plush country-style linens, an en-suite bathroom with a walk-in shower, thirsty towels and deluxe bath products, and a comfortable sitting area with lovely south-facing views of the ancient oak trees. The McNair Room is located on the upper level of the house and features a queen-size bed in plush country-style linens, an en-suite bathroom with a walk-in shower, thirsty towels, and deluxe bath products, and a comfortable sitting area with antique furnishings and gorgeous views of the ancient oak trees outside the windows. 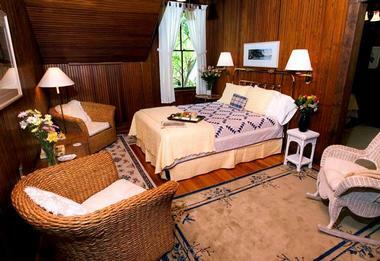 The Cowen Room is a spacious and beautifully appointed room that is perfect for small families, with one queen and one twin bed, a working area with a desk and chair and tasteful furnishings and artworks to add a contemporary touch. The Cowen Room has an en-suite bathroom with a walk-in shower, thirsty towels and deluxe bath products and modern amenities, including complimentary wireless Internet. The McLennan Room is an exquisitely presented room located one the lower level of the inn and features high ceilings, a spacious sitting area with comfortable seating, and a cast iron king-size bed with plush country-style linens. A private bathroom offers an antique claw foot tub, and south-facing windows overlook the inn’s front porch and ancient oak trees in the background. A delicious three-course country breakfast is served in the dining room every morning and includes continental selections of pastries, fresh fruit, cereals, and yogurt, as well as hot entrées, and freshly brewed coffee and tea. A fully stocked guest refrigerator and hot beverages are available in the dining room throughout the day, as well as sweet treats such as home baked cookies and brownies in the evening. Magnolia Springs Bed and Breakfast offers comfortable, country-style accommodations in the form of five beautifully appointed guest rooms and suites with private bathrooms and modern conveniences. The B&B has an elegant, yet relaxed dining room where a sumptuous three-course country breakfast is served every morning and an expansive front porch for unwinding with a cup of tea. The Southern Baldwin area, in which the Magnolia Springs Bed and Breakfast is situated, offers an array of activities and other enjoyable things to see and do. The Bon Secour National Wildlife Refuge is home to miles of beautiful beaches and hiking trails, as well as a plethora of fauna and flora, including the rare beach mouse. The Weeks Bay National Estuarine Research Reserve is a bird lover’s paradise with a network of walking trails and information boards throughout the park, as well as lovely picnic areas. The Bellingrath Gardens and Home feature 65 acres of exquisitely manicured gardens and a museum that documents the history of the South, and the Alabama Gulf Coast Zoo is home to more than 250 animals in natural habitats. Outdoor and recreational activities include fishing, hiking, mountain biking and wildlife watching. The Alabama Coastal Birding Trail is a bird lover's paradise and spans two counties with clear pathways and directional and interpretive signage along the way. The Dauphin Island Bird Sanctuary spans 164 acres and features beautiful maritime forests and has several walking trails for the avid birder.